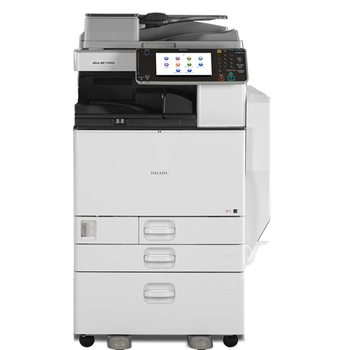 Ricoh is bringing a new print engine into the A3 color range, and replacing the MPC3001, 3501, 4501 and 5501. These four machines have the new look Ricoh has used on its recent A3 and A4 machines. Ricoh is grouping four different speeds with a single print engine: 30, 35, 45 and 55 ppm black and color. At first glance they do not appear to have much in the way of new features compared to the preceding models, but as we work up the DataTechs for DMO we'll look into more depth. What we note straight off though is that the single engine for all four machines offers the MPC3002 and MPC3502 technical specifications equivalent to the MPC4502 and MPC5502 (which was not the case down the preceding range).